Villa Maria is a Private 4 bedroom villa that sleeps 8/9 with private Pool in the traditional village of Kathikas. It is a spacious villa providing an ideal holiday for everybody, whether a small or large family or a group of friends. The soft furnishings have all been carefully colour coordinated and attention to detail has been paid to the interior decoration with lots of little extra touches making it feel like a home. Satellite Television, WIFI Internet Access, DVD and Book Swap Corner. Located in the main house is a fully equipped kitchen area and lounge area, with a dining area Inside and outside on the veranda. A double bedroom and shower room is also on the floor. A staircase leading to the first floor where the master double bedroom with four-poster bed and en-suite shower room is located. The private balcony for this room overlooks the swimming pool and also amazing views of Troodos and the surrounding area. There are a further two twin bedrooms on this level each with private balcony and sharing a full family bathroom complete with whirlpool bath with an overhead shower. A washing machine and sink are located on the small landing area of this floor. The villa has the option available of air conditioning throughout with units that can be used for both cooling and heating, and has a safe box. 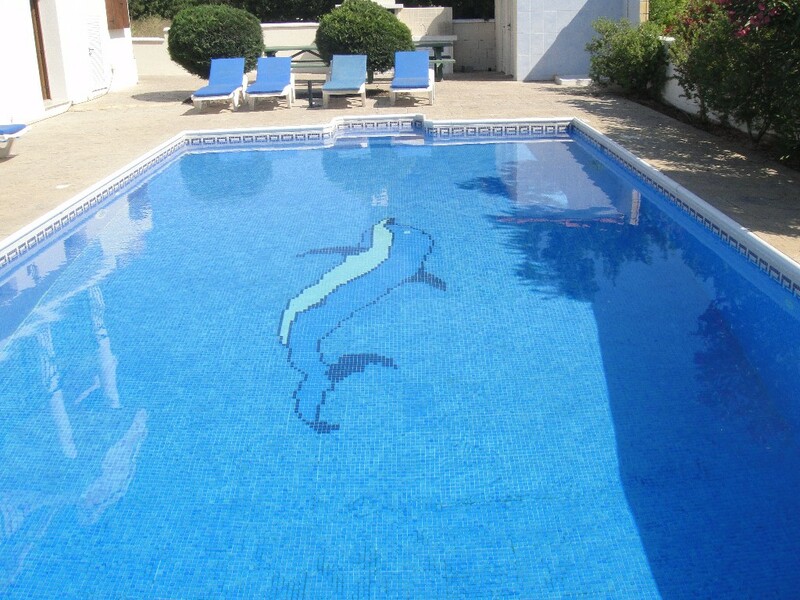 Outside, the large Dolphin tiled 10m x 5m pool with walk-in steps is surrounded by a spacious terrace with sun beds, umbrellas, garden area to play or relax, table and chairs and barbecue. The swimming pool area is private and enjoys outstanding views of the surrounding countryside and Troodos Mountains. The property is situated just 700m from the village centre which offers a good selection of restaurants and tavernas to suit all tastes. The climate around Kathikas area is considered the best in Cyprus. The air crystals clear, the temperatures beautiful, with gentle breezes and little humidity. With the prominent position of this villa means it enjoys uninterrupted views over fields and grapevines to the distant Troodos Mountains. Today, Kathikas is one of the most attractive villages in the area, well known for its great many vineyards, grapes being its main product and their cultivation the main occupation of the villagers. Kathikas is a traditional Cypriot village, with a supermarket, bank and several Restaurants & Taverns. Kathikas has two wineries which can be visited. Coral Bay with safe sanding bathing is a short 10 mins drive away. There are plenty of restaurants, bars and Coral bay also has good nightlife. Paphos town with harbour and port is approx 30 mins drive away. The Akamas peninsular and forest, with nature, walking and wildlife is 20 mins away. Troodos mountains for scenery and skiing in winter is approx one hour's drive. We offer all guests a Basic welcome pack on arrival which includes: Coffee, Sugar, Tea, Milk, Bread, Juice, Eggs, Ham, Cheese, Butter, Jams, Water, Beers and Wine. To confirm a booking and secure the dates you require a Non refundable deposit of 25% is required, with the final balance of 75% + security deposit is due 8 weeks prior to arrival. For More information, Availability Check, Rates or Reservations, please visit KathikasVillaMaria.com.